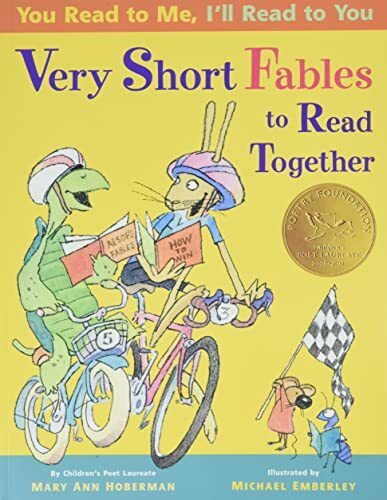 Mary Ann Hoberman and Michael Emberley have added Aesop's fables to their bestselling and award-winning series. Rediscover familiar tales and find new favorites in this delightful collection--these are fables as you've never seen them before! Aesop's fables are perennial favorites with parents, teachers, librarians, and kids alike, and this collection includes both beloved tales such as "The Ant and the Grasshopper" and "The Lion and the Mouse," as well as less familiar but equally charming stories like "The Peacock and the Crane." While there are many other editions of Aesop's fables, most include the traditional text and either focus on a single story or include hundreds of fables. Mary Ann's rhyming text coupled with Michael's lively art offers a more approachable and kid-friendly retelling of each tale, and fables are a perfect fit for the YRTM format.